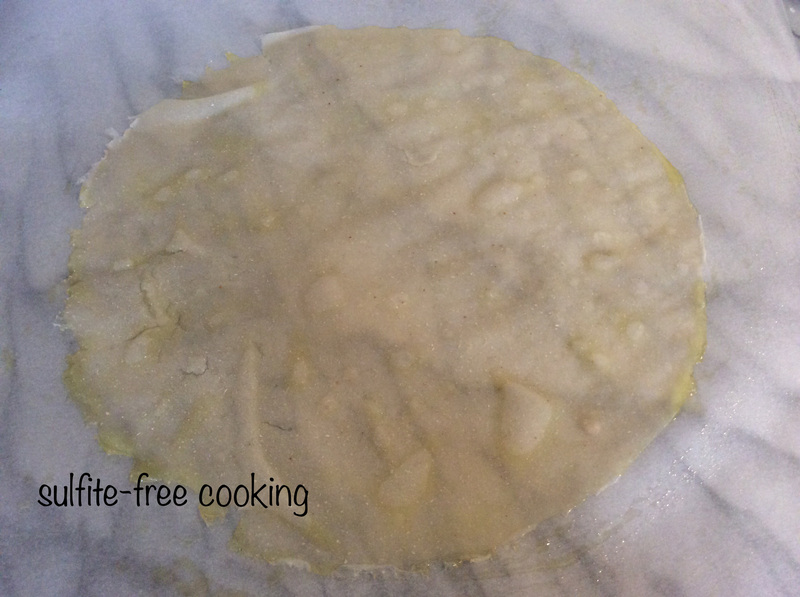 I decided to post this recipe after an exchange I had with Dolly about gluten-free phyllo dough, which as far as I know, cannot readily be found in stores. I have now been making my own since spring of 2015, and the original recipe was posted on my French blog: ma cuisine sans sulfites. I love the taste of phyllo leaves after they have been baked or pan-fried. The folding turns them into something somewhat similar to flaky pastry. A word of warning however: this recipe is a little time consuming. Why? Because unlike pancakes or crêpes, the batter, which is nothing to make really, must be poured onto a COLD non-stick skillet. The implication is that you will have to wait before each sheet, unless you have two skillets, which slightly speeds up the process. I don’t bother nowadays. Whenever I decide to make my gluten-free phyllo leaves, I end up multi-tasking : I read the paper, do some light house cleaning, or even type a recipe, but nothing that will require high concentration. Are you ready ? Don’t worry : I have included a video to illustrate how I proceed. NOTE: The original soundtrack on the video (in French) was deleted and replaced with my explanations in English 😇. NOTE : sorghum flour does not work well here, neither does millet flour, and I am not sure how buckwheat would behave or whether you can do without the starch. – 1 TBSP agave nectar, totally optional, and only if you are planning to use the leaves in a dessert recipe. You will also need several paper / plastic disposable plates (which I keep from one time to the next, as I hate the idea of tossing plastic into my garbage can every time) to separate your phyllo leaves until you decide to use them. This will even allow you to FREEZE YOUR BATCH UNTIL YOU USE THEM. 1. Mix the flours and salt in a bowl, make a well in the center and add the egg white. Start beating the white and the flour with a fork, adding water gradually to avoid lumps. Batter should be thinner than pancake batter, more like a crêpe batter. Add agave nectar if desired at this point. Let the batter sit for about an hour. Start mixing the egg white and flour. As it gets harder, add water. Make sure there aren’t any lumps. b. As it gets harder, add water. c. Make sure there are no lumps. 2. For cooking the leaves, use a 22 cm (8.5 inches) non-stick skillet, Teflon type. A ceramic or stainless steel pan won’t work here. DO NOT HEAT THE SKILLET before you start. Stir the batter well. You will see in the video that if it is too thick, (which happens when you let it sit for a while), it is harder to spread. Pour about 20 ml (= 4 tsp) of the well-mixed batter into the pan, and shake horizontally to spread it everywhere as evenly as possible. Take your time. As the pan is cold, you can even grab it with both hands. If you find there are some « holes » left, just patch them up with a light finger BEFORE turning on the heat. 3. Turn on low heat and watch the batter change color in successive “waves”: first it turns translucent, then it gets opaque again. As soon as the edges start peeling off, turn off the heat and REMOVE FROM THE BURNER. You will notice here that you can see through the cooked batter and that the left side is starting to detach itself from the skillet. 4. Proceed to peel off the cooked phyllo leaf gently and place on an oiled sheet of parchment paper or on a disposable plate. Wait for the skillet to cool down. I sometimes move it around on the counter top to help speed the process. 5. When your skillet feels cool again, stir the batter before pouring the next 20 ml. If you have been patient enough to read this far, I am totally sure you will have the patience to try this recipe. You will not be disappointed with the result. These phyllo leaves are usually filled then cooked in a frying pan. Of course I will gladly answer any questions you may have. Thank you so much, dear Joelle, for linking me to your wonderful recipe!